Relates to the four aircraft which are transferred to Serbia. Split into the Czech Republic and Slovakia on January 1, 1993. The aircraft of it's air force were divided between both new countries. 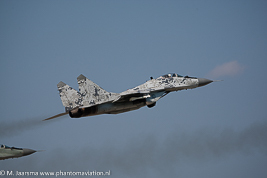 The Mig-29s (18 Mig-29A and two Mig-29UB) were equally divided with each country 10 aircraft assigned to its air force. Inherted 10 Mig-29s (nine Mig-29A and one Mig-29UB) from Czechoslovakia. These were all sold to Poland. Reunited with West Germany on October 3, 1990. It's aircraft were transferred to the German Air Force. Received 12 Mig-29s (nine Mig-29A and three Mig-29UB) when still part of the Warsaw pact. All are operational. 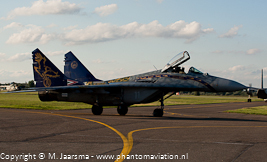 Bought 10 Mig-29s from the Czech republic. All are operational. Bought 23 Mig-29s from Germany. Half of the Mig-29s should be operational with the others preserved in museums, stored or in use as instructional airframes. 16 Mig-29's inherited from the former Yugoslavian Air Force. Four aircraft currently being upgraded in Belarus who provided these aircraft and Mig-29's received from Russia in 2017. Inherted 10 Mig-29s (nine Mig-29A and one Mig-29UB) from Czechoslovakia. Fifhteen Mig-29s (13 Mig-29A and two Mig-29UB) were received from Russia as part of a debt write-off on two batches (Batch 1: five Mig-29A and two Mig-29UB in 1994. Batch 2: five Mig-29A and one Mig-29UB in 1995). 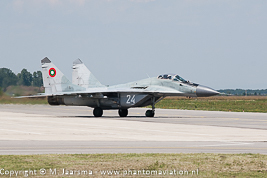 Part of its Mig-29 fleet received an upgrade (Mig-29AS and Mig-29UBS) with the remaining Fulcrums withdrawn from use.